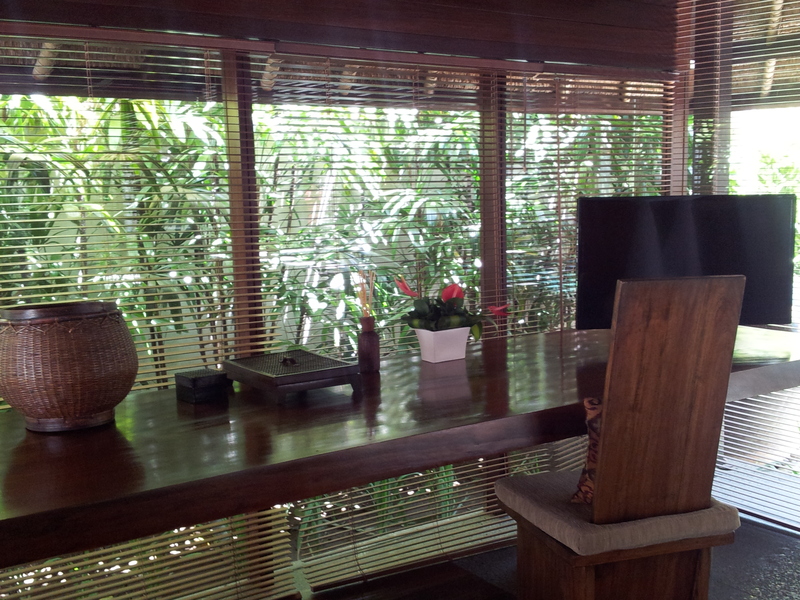 Inside our luxury private pool villa in Bali at The Kayumanis Resort, Jimbaran – Why Waste Annual Leave? In England, we call a coconut a coconut. 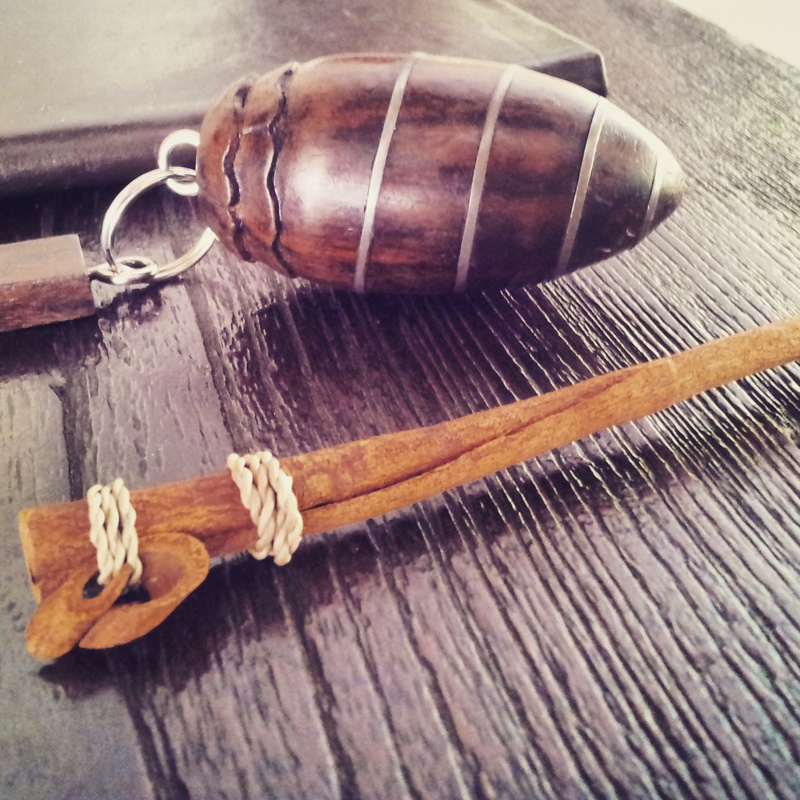 Obviously, it has a shell, water, milk and oil but all are prefixed with the word, “coconut.” Now, in case you are questioning my sanity and wondering why I am rambling on with a linguistic analysis of a coconut in a post seemingly about a hotel – read on. In the Balinese language, each different part of the coconut has its own distinct name and all of the 19 pool villas at Kayumanis Resort in Jimbaran are named after one of them. Our home in Jimbaran was to be the Seseh villa and in plain English, that means we were spending our Jimbaran days staying in the coconut tree trunk! This is what our butler told us as he guided us to our room. 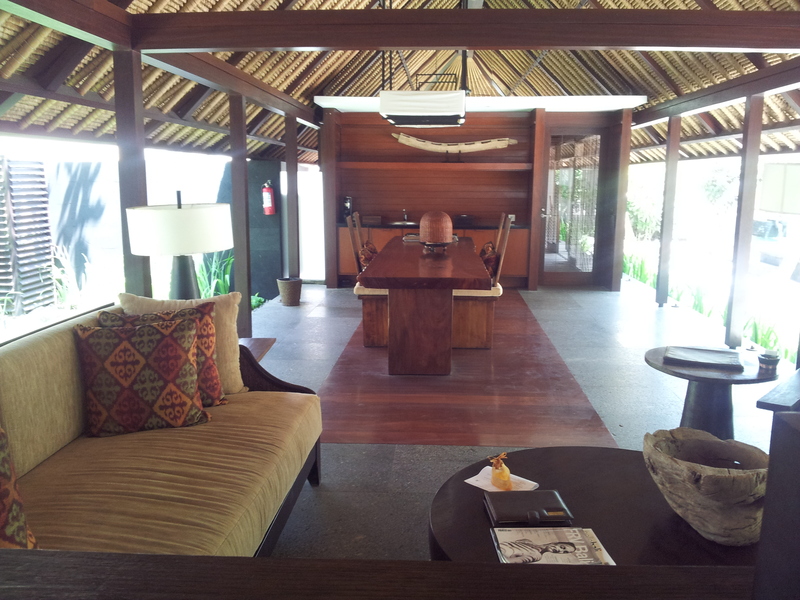 Each villa has an assigned 24 hour butler and room service facility just in case you should need a snack at 3am. Though if you read my last Kayumanis post about the delicious complimentary afternoon tea that Kayumanis feed you, then this is most unlikely, not to mention the cookie jar, loaded to the brim to bring down even the most disciplined, the daily fresh fruit platter and free minibar! We unlock our villa, walk down a pathway and step into our open air living room with a view of our tree-fringed private infinity-edge pool. We assume one of the two buildings facing us is ours and the other, our neighbour’s. But we are wrong. Apparently, this entire space is ours for the stay. The smaller building is the second bedroom (Pumpkin states this is where he will camp if I nag or chat too much), the larger one is our master bedroom. 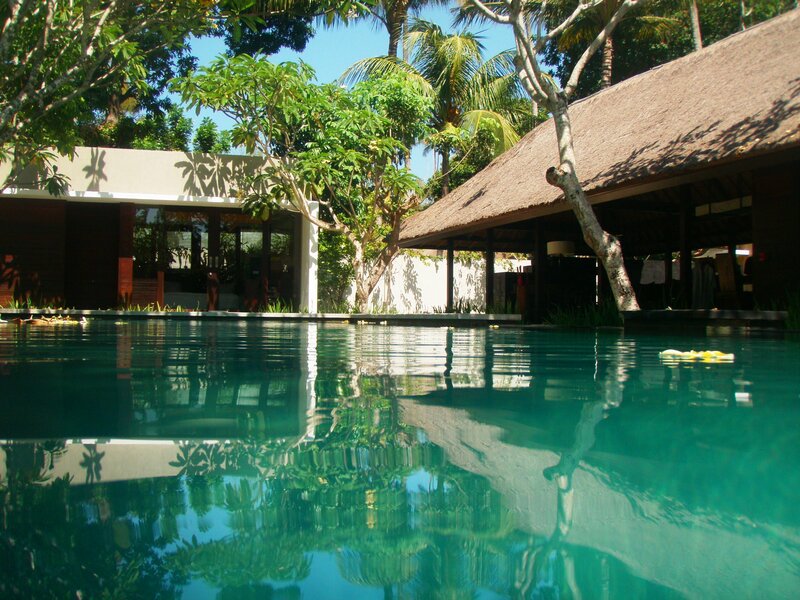 The villa is huge, approximately 500 square metres and we dance a little circle of excitement in our heads. We are Londoners so the concepts of space and fresh air bring jolts of welcome glee to our lives. A large flat screen TV lies at one end of the lounge (you are never supposed to admit that you watch TV in on holiday but occasionally, we do.) A smaller TV is put in your bedroom for comfort and CDs and DVDs can be borrowed from the hotel library. 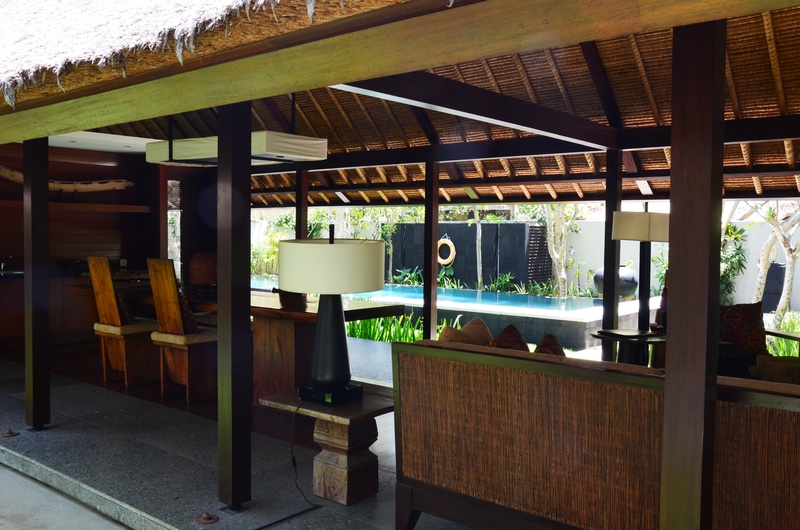 With romantic dim-lighting and elegant wooden furniture, the villas are styled with chic contemporary Balinese decor and artwork and the small touches do not go unnoticed. Even the free hotel pen, devoid of tacky logos, is uniquely made from a cinnamon stick, a reference to Kayumanis, which means cinnamon. They have thought of everything – you can even leave your international adapters at home because there’s an international multi-purpose one here. The living room has an open plan kitchen layout with a solid wooden dining table in the centre, which could easily seat at least ten with its own hob, crockery and utensils in the cupboards. I’ve lived with an open plan kitchen setting for ten years now and the social freedom it enables means that this layout is something I would look for in any future home. I cannot help but make references to home when I am here. There is something in the way the staff treat you here which enforces intangible parallels. 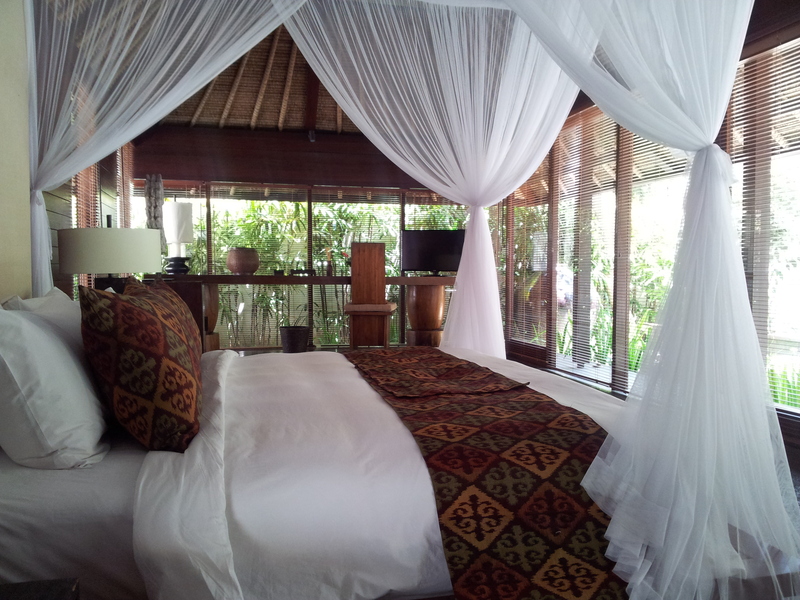 The villa is reminiscent of a very well-equipped self catered apartment except that it is a fully catered luxury resort! I am not one to cook my own meals on holiday (it is hard enough to get me to put together an edible meal at home) but if that is what floats your boat, the facilities are all there. 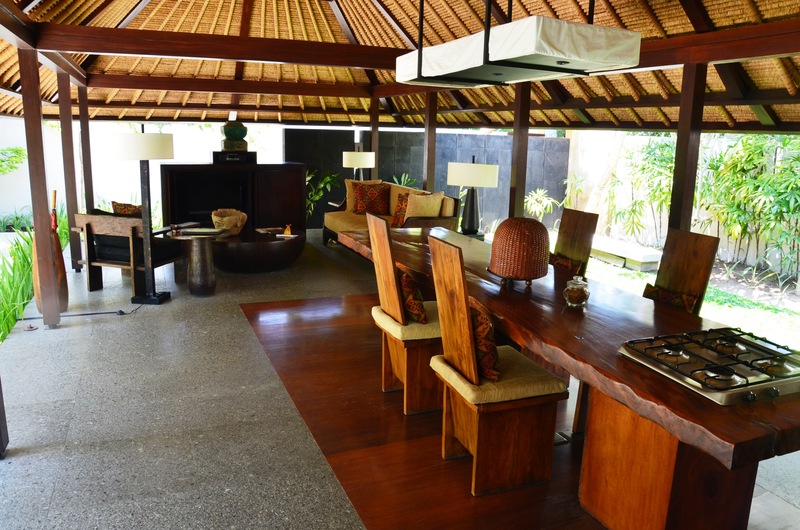 For a fun alternative, you can even arrange private Balinese cooking class in your villa. Both bedrooms come with their own bathroom. 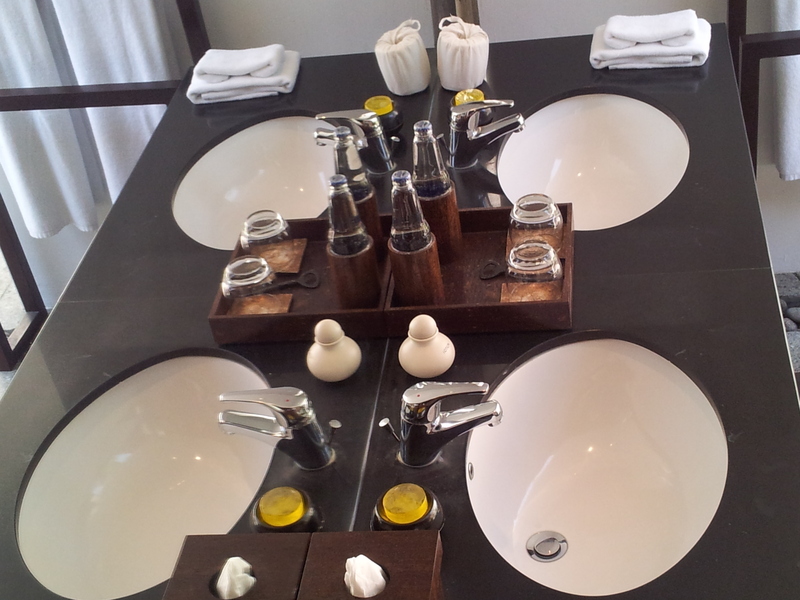 The larger bathroom is completely private but is all outdoors, including the toilet, sinks, shower and bathtub. One evening, we came back after a stroll on the beach to find that the turn down fairies had flown in, laid out robes on our beds and scattered rose petals in the humid skies, floating with a graceful determination, injecting vibrancy into our final nights in Bali. Have you ever stayed in a hotel that really felt like home? Disclaimer: We received complimentary spa treatments and a meal for review purposes but as ever, I remain an opinionated little travel blogger and all views, good or bad, are entirely my own. This place looks truly amazing. Luxury if ever I saw it. Not sure I’m keen on the outdoor bathroom/shower. I’ve stayed in a hotel with a similar outdoor shower and it was terrible for getting mosquito bites. I do love the hotel pen though. As for words for the many parts of a coconut it reminds me of a conversation I had many years ago with 2 French girls. They were totally perplexed as to why us Brits didn’t have a word for land/ice underneath an igloo. My response was why would we even need a word for that?! 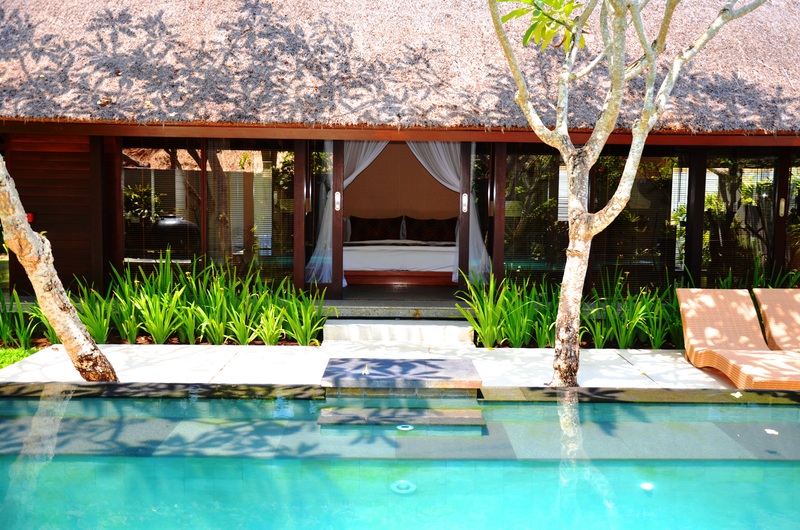 Simply wonderful, you just can’t beat Bali for ultra-luxe accommodation, this is a villa that’s right up my street ;). I can’t wait to be there again in three months time. it looks incredible! Bali is high up on my list of places I would love to go. 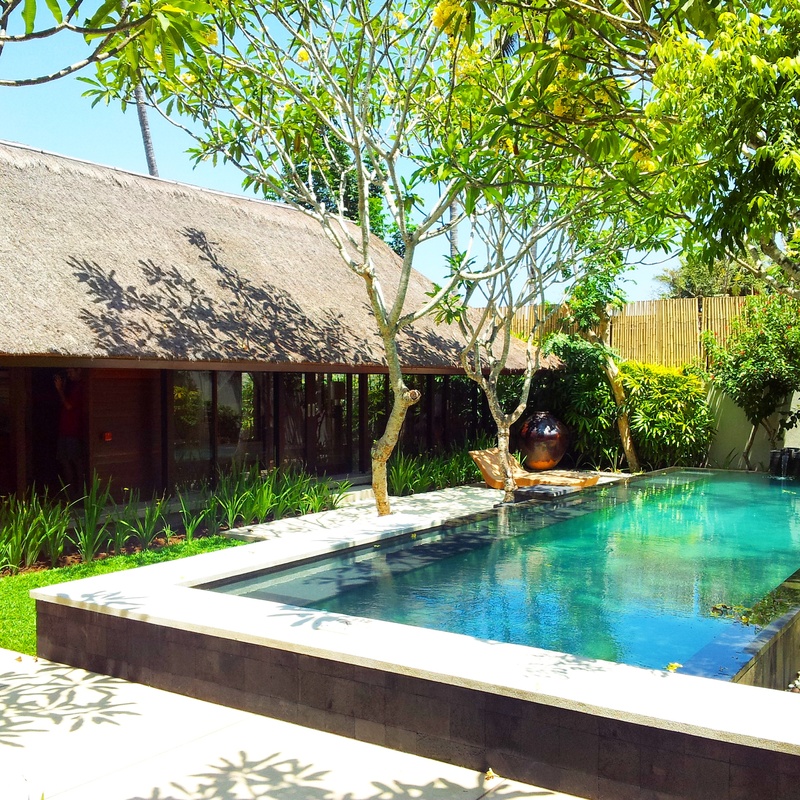 It’s fantastic Laura – your money goes quite a long way out there and even aside from the accommodation, Bali’s culture, scenery and enormously friendly people totally exceeded my expectations! Hehe, I’d love to return one day Agness so maybe you can tag along with me next time It really did feel like a peaceful paradise out there! I love Bali! Looks seriously gorgeous, love Bali! That villa looks gorgeous! I think my trip to Bali four years ago was probably the most relaxing holiday I’ve ever been on. If that flight was a bit shorter I’d be back every year! Totally agree Lucy! Such a magical place that I’d go back so often if it was nearer – kind of jealous of the Australians in that respect! 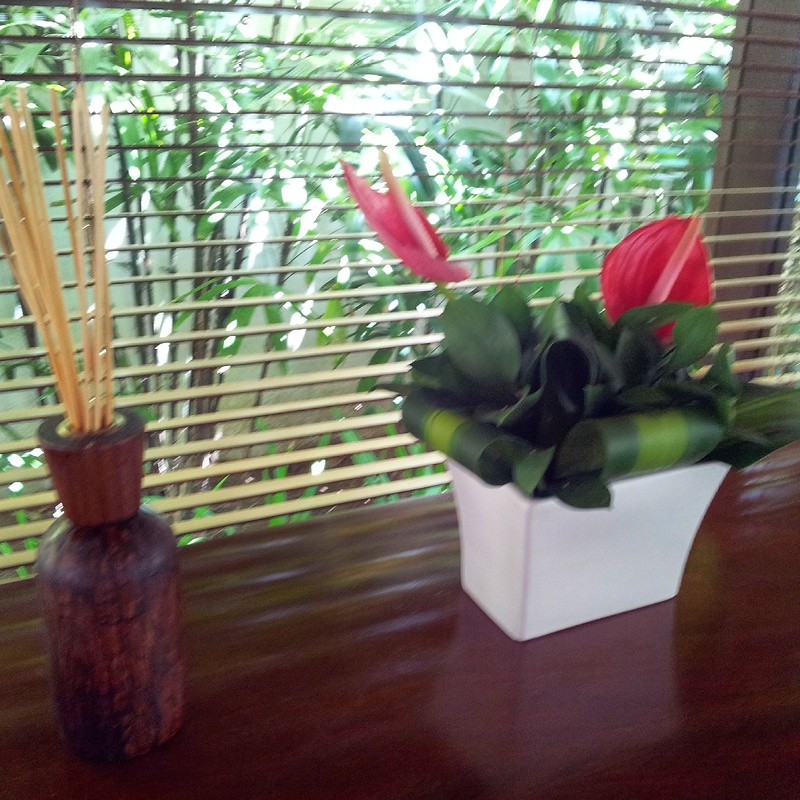 So glad to hear you enjoyed your time in Bali – which part/s were you in when you went? Oh my goodness! I can’t decide what I like the most – that pool, the rose-petaled bathtub or the outdoor shower! Hehe, please don’t be calling me a pampered little lady in front of Pumpkin otherwise I fear he may have me reverted to his pre-me bachelor style of travel involving more backpacks, hiking boots and tents than I would care for 😉 It really was lovely though and even though I’m always more a shower girl than bath, the rose petal one was too pretty to deny! Thanks again for reading Upasna and for your kind words! It was VERY hard to leave Emily – hubby had to practically carry me off the bed because I was point blank refusing to get up voluntarily! It was certainly different to a regular bathroom but I just had to keep reminding myself that it was totally private as I’d have felt self conscious otherwise! Oh. My. God. Why did you ever come back?! What a stunning villa! I’ve never been to Bali but really, really, reaaaaally want to go will keep this hotel in mind if I ever get there as it is right up my street! Oh my goodness. This looks beyond luxurious!! I love the open kitchen concept with the stove range at the end of the table!! And the outdoors bathroom. 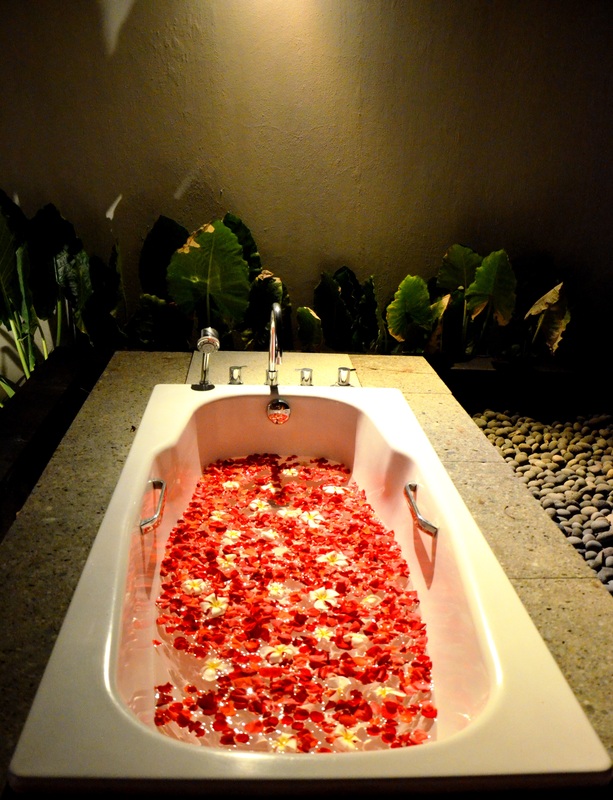 It’s also a dream to bathe in rose petaled bath water! 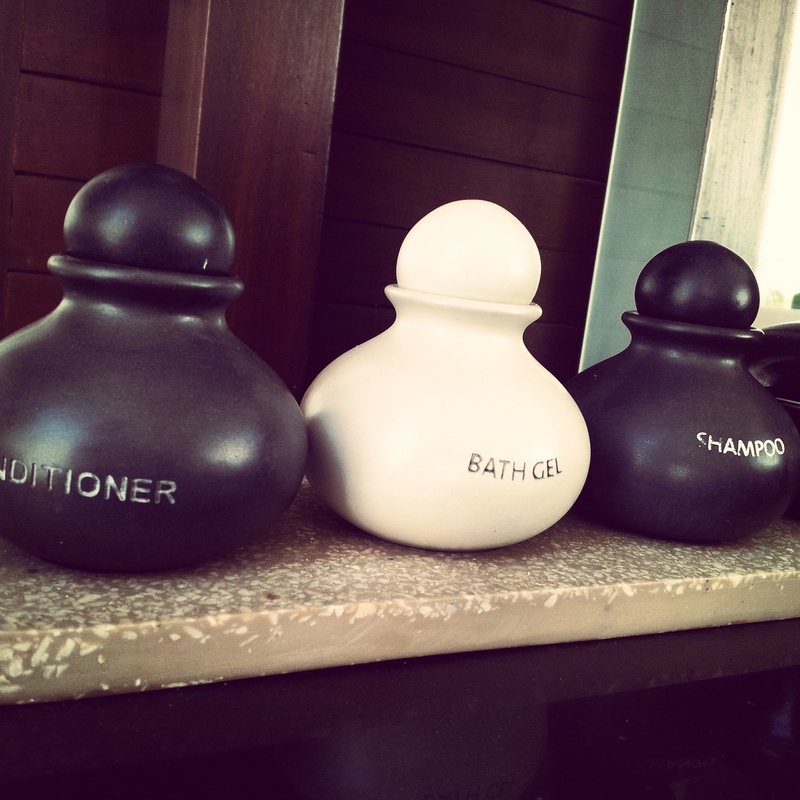 I can say that I have never stayed anywhere so luxurious nor been so pampered. This looks like a dream vacation! Thank you Anna! Luxurious is absolutely the right word and honestly, I think I spent every minute of the stay feeling grateful for it and trying to enjoy every moment but somehow, despite all that pampering, the staff really manage to make it feel like home, which I know sounds like a contradiction in terms but we felt so at ease there much more so than in most other hotels. I think it’s the open layout and the space and privacy that helps and the staff were so sweet that I genuinely felt sad to leave! Ha ha, yes we do call a coconut a coconut but I still ove the fact there are 19 words for diff parts of the coconut in Balinese! It all looks so beautiful! I am really jealous – looks like the best place to relax! I would definitely feel at home there. I have wanted to visit Bali ever since reading ‘Eat, Pray, Love’! I hate to admit thus Holly but I’ve not read it yet! It’s on my list still! But yes, it’s lovely that there are so many words for a coconut – makes our language seem very simple in comparison! 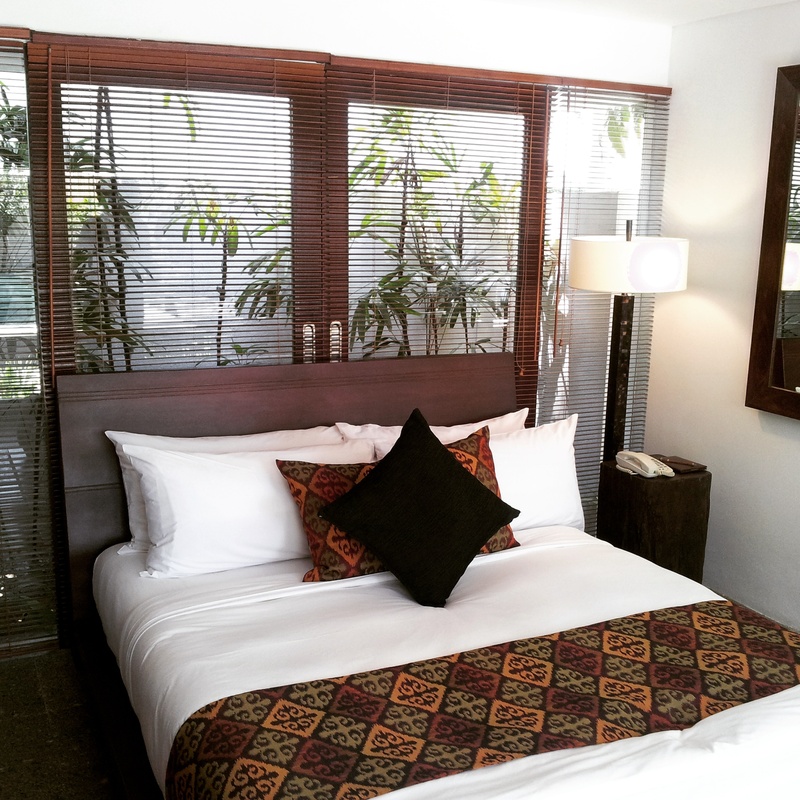 And yes, it was very luxurious and very friendly and homely as I found Bali to be in general – hope you get a chance to go soon ☺ Thanks so much for reading! I have some serious hotel envy. That room is one of the nicest I’ve seen. It’s always a good sign when your hotel room is larger than your flat. It means you done something right! I also love the whole outdoor bathroom thing. Makes the setting and room even more unique. It honestly came as such a surprise seeing how big the hotel room was – turned up thinking our room must be somewhere within that large complex not that our room WAS that whole complex! The outdoor bathroom had me a little nervous at first but it’s totally private so other than perhaps the birds, you can still shower without an audience Thanks so much for reading! This looks wonderful Shikha! 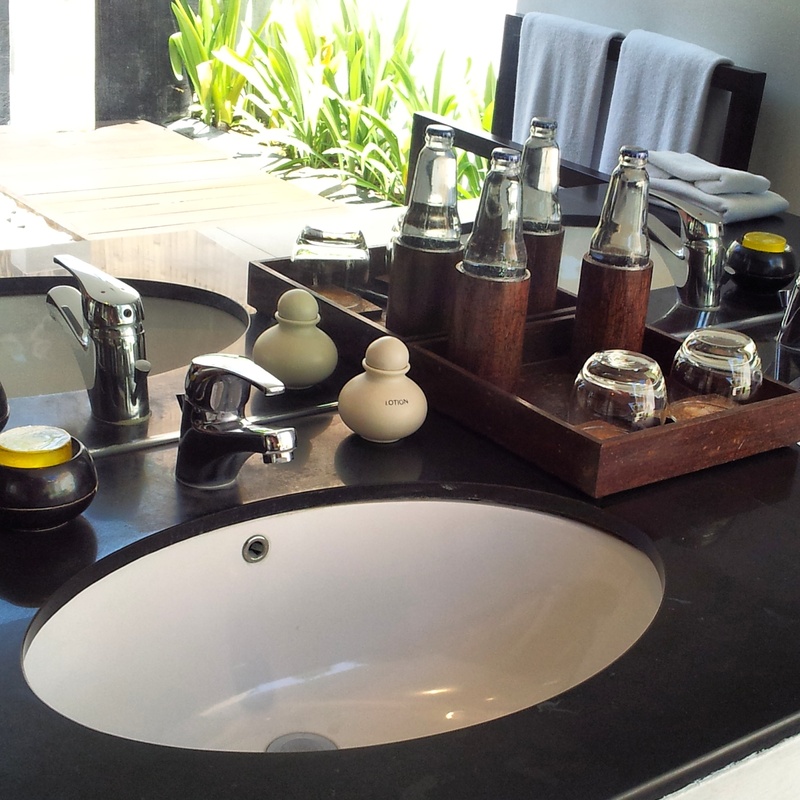 I really loved the massive outdoor bathroom, it also means that they expect the weather to be good enough for you to be able to use an outdoor bathroom which is great! Did you ever get around to ordering any 3 am snacks? Pingback: Photos of a Beautiful Sunset in Jimbaran Bay, Bali | Why Waste Annual Leave? 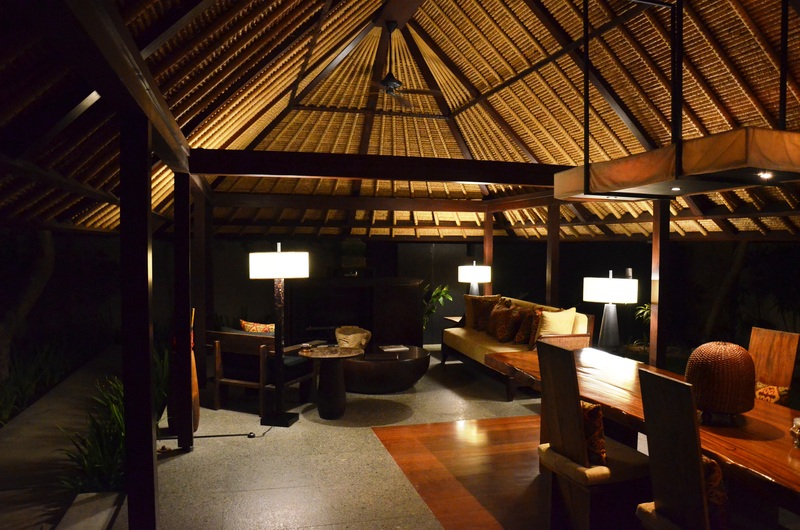 Pingback: A Chef’s Collaboration Dinner with Kayumanis Resort Hotels, Bali | Why Waste Annual Leave? Pingback: An Inside Tour of Celebrity Summit Cruise Ship | Why Waste Annual Leave? Pingback: A First Experience with an Air BnB Apartment in Hvar, Croatia | Why Waste Annual Leave?